Physical and mechanical properties of ceramic-based scaffolds can be modulated by introducing hydrogel coatings on their surface. For instance, hydrogels can be used as elastic layers to overcome the brittleness of synthetic ceramic materials or to control the delivery of essential osteogenic factors. In this work, we aimed to achieve both goals by fabricating a novel cytocompatible hydrogel made of gelatin-alginate as a coating for beta-tricalcium phosphate (β-TCP) scaffolds. The hydrogel synthesis was optimized by varying the concentration of the crosslinkers N-hydroxysuccinimide and N-ethyl-N′-(3-dimethyl aminopropyl) carbodiimide (NHS/EDC). Swelling, degradability and mechanical studies were carried out to identify the suitable hydrogel coating formulation for the β-TCP scaffolds. The cytocompatibility of the coated ceramic was assessed in vitro by testing the proliferation and the osteogenic differentiation of human adipose stem cell (hASCs) for 2 weeks. The designed hydrogel layer could withstand cyclic compression and protected the brittle internal core of the ceramic. The hydrogel coating modulated the diffusion of the model protein BSA according to the degree of crosslinking of the hydrogel layer. Additionally, the polymeric network was able to retain positively charged proteins such as lysozyme due to the strong electrostatic interactions with carboxylic groups of alginate. A higher expression of alkaline phosphatase activity was found on hASCs seeded on the coated scaffolds compared to the hydrogels without any β-TCP. 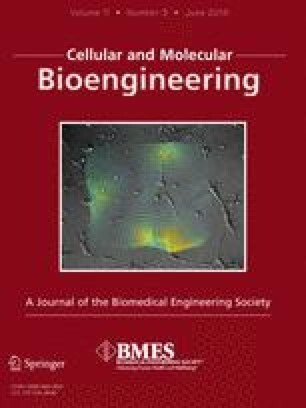 Overall, the hydrogel coating characterized in this study represents a valid strategy to overcome limitations of brittle ceramic-based materials used as scaffolds for bone tissue engineering applications. Associate Editor Stephanie Michelle Willerth oversaw the review of this article. The online version of this article ( https://doi.org/10.1007/s12195-018-0521-3) contains supplementary material, which is available to authorized users. A.P. acknowledges an investigator grant provided by the Institutional Development Award (IDeA) from the National Institute of General Medical Sciences (NIGMS) of the NIH Award Number P20GM103638, University of Kansas New Faculty General Research Fund, and Umbilical Cord Matrix Project fund from the State of Kansas (to C.B. and A.P.). J.W. would like to acknowledge the funding support provided by the U.S. National Institute of Health (NIH) under Award Number R01 DE018713. Settimio Pacelli, Sayantani Basu, Cory Berkland, Jinxi Wang and Arghya Paul have no conflicts of interest to disclose. This article does not contain any studies with human participants or animals performed by any of the authors. Only commercially obtained cells were used.